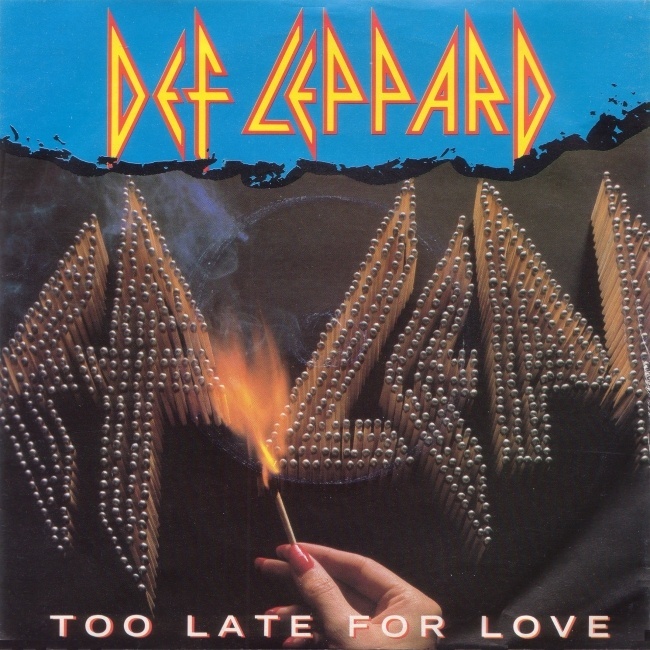 Def Leppard's classic single Too Late For Love reached Number 86 in the UK charts on this day in 1983. The third UK single to be released from the Pyromania album. It was released on 25th November 1983 and would reach Number 86 in the Top 100 singles chart. The follow up to Rock Of Ages which had peaked at Number 41 in September. 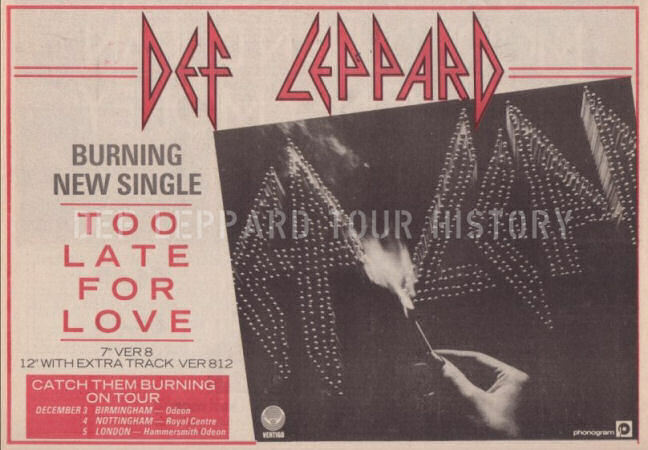 The single was released to help promote the short three date UK tour in early December which saw them play in Birmingham, Nottingham and London. It peaked at Number 86 on 17th December 1983 having entered the chart at 88 the week before. The lowest charting UK single of the band's career only spent two weeks on the Top 100. They would have to wait until August 1987 for their first Top 40 hit with 'Animal' which also became their first ever Top 10 single. The Flying Pickets were at Number One on this day with their single 'Only You'. Fellow UK rock artist Ozzy Osbourne was at Number 26 with 'Back At The Moon'. "By the time we went back to Europe to do the end of the world tour, they decided they wanted to go to radio with "Too Late For Love," but we weren't really in any kind of a position to make a video for it. Plus, there was this feeling amongst us like, "It's a fourth single, but it's just being put out there for the sake of it. It's only being released because of the success of the first three." "It was never a game plan in January of that year. It was a on the spur-of-the-moment decision made maybe in August or September that we would go with a full single, to which we responded, "Well, okay, fine, whatever you want. But there won't be a video, because we're too busy touring." It was just the record company trying to prolong the length of the album and see if that song was going to fly." "But as great a song as it is, I believe that any success that it achieved was based on the fact that the first three did so well. It's a fantastic album track, but it's not a single. To me. You know what I mean? " "It's like, "Are you kidding me?" It's just a great album track. It's not a single. It doesn't have the hook. It's a brilliant piece of arrangement, it's a good bit of writing, it's a great lyric, it's a brilliant piece of music. But it's a rock track. It's never going to challenge "Thriller" or "Billie Jean." Whereas, "Photograph" and "Rock of Ages" were, because they were anthemic in a lyrical and a vocal way. They were a call to arms. And "Too Late for Love" is a bit more "lamentable," if you like."